In the perception of society, crime equals corruption. Synonymous with each other to the point of perceived mutual exclusivity, it begs the question of whether one can commit crime without being corrupt. With a clean-cut demeanor, Abel Morales, played with a subtle intensity by Oscar Isaac, faces down the dilemma of walking that line between crime and corruption. The owner of a natural gas company, Morales, and lawyer Andrew Walsh (Albert Brooks) are placed in an otherwise compromising position when their delivery drivers start getting knocked over for the gas. With no full picture of the extent of his mob ties, Morales is aiming to play the game as straight as he can. 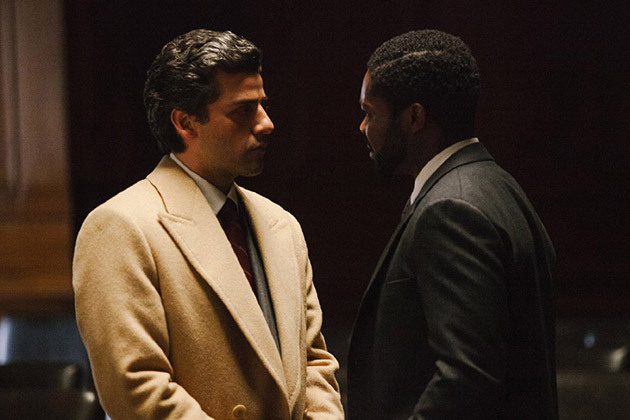 Caught between the theft of his gas by what is probably another member of the mafia and a District Attorney (David Oyelowo) who’s determined Morales is corrupt and must be brought down. 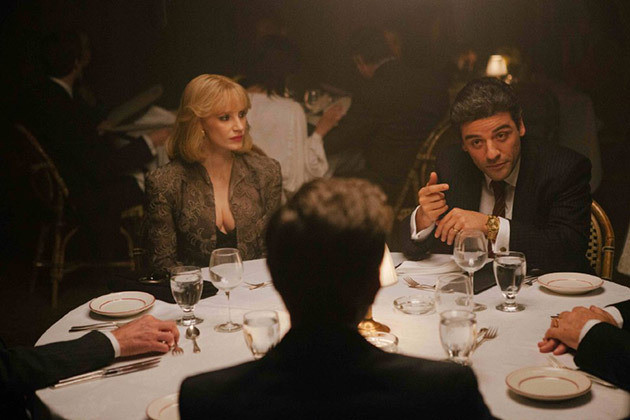 Set against the backdrop of New York in 1981, A Most Violent Year seeks to capture the parallel to what’s considered the most violent year in the city’s history. As crime all around Morales rises, his aim to stay straight never seems to waiver. Part of the enjoyment here is watching Morales for signs of compromise. As situations become more desperate Morales and his wife Anna (Jessica Chastain) seek results that will keep their family and business afloat. Things get complicated though when the threats facing Morales’s company start hitting home. A prowler leaves a gun outside their home that gets found later by their young daughter. Meanwhile, the drivers who deliver gas for Morales want to take actions against being robbed, by arming themselves, which could jeopardize everything for the company under such government scrutiny. As the problems compound Morales stays even keeled. Like with his previous two movies Margin Call and All Is Lost, writer and director J.C. Chandor again takes a look at the price of capital, and it’s not pretty. Individual character autonomy means that everybody involved has a goal in mind, and with everyone pulling for the path to be straightened and the chips to land exactly where they should, sacrifices must be made. In one of the movie’s defining scenes, Morales gives a lesson to newly hired salespeople about how to close a sell. Like many aspects involved with this movie, there’s a semblance to The Godfather that comes to mind as Morales delivers his perfectly planned speech. Cool and confident like Michael Corleone in a way that commands respect, Morales knows how to achieve the goal he’s after. But unlike Corleone, Morales aims to keep himself from being changed by the situation he’s in, and in turn change the decisions he needs to make. The drawback is Chandor’s deliberate pacing coupled with an acute attention to detail that had me at times asking if I cared enough about natural gas to find the ins and outs of how to operate such a business interesting and not unnecessarily tedious. Fortunately the pacing leads to a slow burn that makes the details of business dealings an integral part of the point of the story, capitalism has a price. The message, while obviously important, has pretty much one conclusion that could be seen as cliched and overkill, but ultimately is necessary to make the point Chandor wants to make. Shot in starkly lit environments and framing the characters with a surrounding openness creates a feeling of the ominousness of what each of them faces. The slow build of the weight of decisions Morales makes allows for a creeping tension under the surface of the starkness. Chastain displays a commanding presence that at times steals the focus. It’s the kind of performance in a role that makes a movie work more than it would’ve without their participation. Albert Brooks, like in Drive, takes another acting departure from his comedic roots, providing the Robert Duvall consigliori to Isaac’s Michael Corleone. It might be the most subdued role in an otherwise subdued movie, but there’s always a welcomed addition of Brooks to any movie. With just three movies under his belt, Chandor has displayed a maturity in his storytelling. And despite some obvious moments of point making, crafted a nuanced approach to political criticism that could otherwise be eye-roll inducing in more blunt hands. The total weight of the movie’s slow burn really didn’t take hold on me until after the movie had ended. It might be a slow ride, but it makes for a richer character and a more poignant story.